Jenna is a property manager and ardent patron/volunteer in the local music, art & theater community. For one weekend only, a Dublin pub is nestled in the heart of downtown Wilmington with Once, the Tony award-winning Broadway musical, taking audiences on a captivating journey with touching songs and heartfelt performances. The show's tagline – "His music needed one thing. Her." – perfectly encapsulates the storyline of a brokenhearted street musician and Czech-immigrant muse. 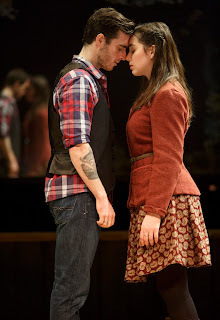 Sam Cieri and Mackenzie Lesser-Roy brilliantly play the lead characters simply named Guy and Girl, who demonstrate such incredible emotional vulnerability as they struggle to move through life and their own complex, unlikely connection. The tender moments and songs they share bring to life the universal themes of moving past fear and embracing one's destiny. Unlike typical Broadway musicals, there is no pit orchestra. Instead, every instrument is performed on stage by the talented musician actors. It's literally music in motion as the guitars, mandolins, accordions and more all get swept into the choreographed dances. As a novel bonus, theatregoers are invited to come onstage as pub patrons during both pre-show and intermission. Many of the cast's musician actors treat them to a rollicking live jam as they enjoy their drinks. Several notable cast members include John Hays – who brings welcome comic relief as Billy, a raucous but endearing piano store owner – as well as 9-year-old Lily Caputo, a Brandywine Valley resident making her Broadway debut, who brings sweet, youthful energy to her role as Girl's daughter. While 13 cast members dazzle onstage, the character without program recognition is Dublin itself. The Irish capital comes to life through the storyline and its characters, highlighting Dublin's incredible diversity and energy. A particularly poignant line, "You can't have a city without music," underscores this point. 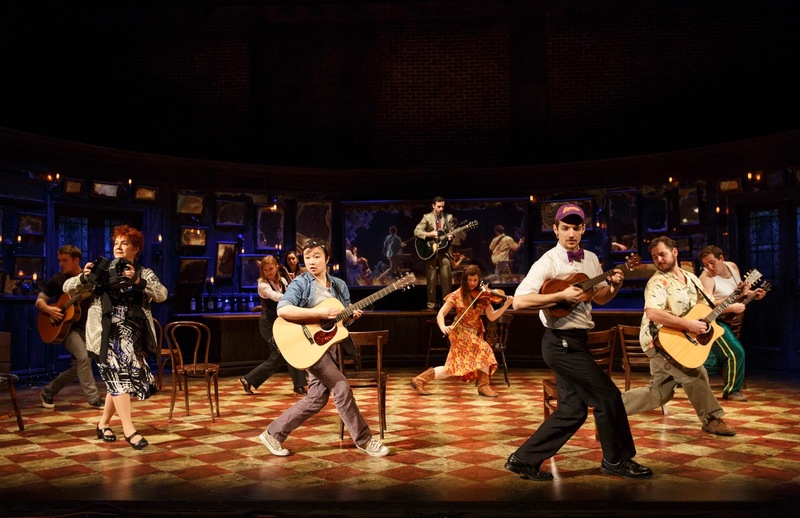 Falling Slowly is the show's signature song with soaring melodies and vocals. It's the Oscar winner for Best Song from the 2007 indie film, upon which this musical is based. Ranging from a cappella songs, solo numbers and rousing group performances, the music in this show delivers an emotional wallop with earnest lyrics and beautiful melodies, written by Glen Hansard and Markéta Irglová, stars of the original film. Once incorporates many clever elements in its minimalist staging and storytelling, which includes inventive scene changes, dramatic lighting and original use of subtitles to illustrate the private exchanges and lively debates between Czech-speaking characters. While the national tour sadly ends soon, fortunately new licensing rights will allow regional theaters to begin staging their own productions of Once. But in the meantime, this is a top-notch unconventional and romantic musical worth experiencing immediately. Once runs through April 2 at The Playhouse on Rodney Square. Tickets range from $65-$85 and discounts are available for seniors, groups of 10 or more and children ages 12 and under.